There were powerful speeches by Women’s Medical Fund Director Susan Schewel, Philadelphia NOW President Nina Ahmad, City Councilwomen Cindy Bass and Blondell Reynolds Brown, among others. 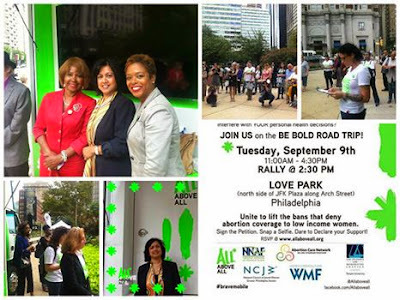 Nina Ahmad’s well-reasoned, inspirational speech is posted here. In recent years the feminist movement has backed away from the struggle to insure that all women regardless of their economic resources have access to the full range of reproductive health services. In Pennsylvania, the coalition supporting the PA Women’s Health Agenda --which if enacted would be major step forward for women--has not included Medicaid funding for abortion, ostensibly fearing it might jeopardize passage of other measures that would greatly benefit women. Protecting women’s right to access health care facilities is critically important but if a woman lacks the resources to pay for an abortion, protection from harassment doesn’t do much for her. If the Women’s Health Agenda were an omnibus bill and we were asking legislators to vote the entire agenda up or down, I could understand the argument that including Medicaid funding for abortion would jeopardize the other provisions. But the approach is not all or nothing, but rather to focus on particular issues in stages. Yes, Medicaid funding for abortion in PA is not politically possible right now. However, we have seen rapid changes in public attitudes regarding issues also thought politically impossible—e.g., marriage equality, decriminalization of marijuana. When feminists draw up a women’s health agenda, “women” must include all women, and "health care" must include the full range of women’s health care including access to abortion. It seems as if I have been retired forever, while at the same time I feel as if these 5 years have passed very quickly. 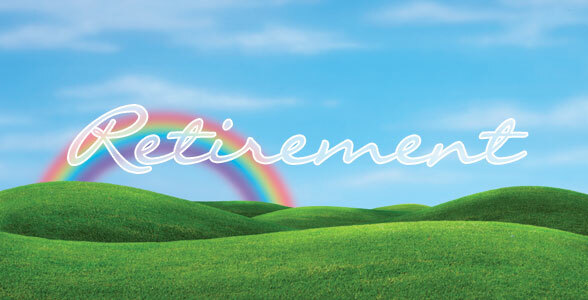 When I retired, I had specific goals I wanted very much to accomplish. Now I’m so much less goal driven. The early retirement years can be very good years if you have health and energy to enjoy life, to read, to write, participate in civic life. I've managed to accomplish some of what I had hope to do but what I have enjoyed the most these past 5 years is just hanging out with my family and friends, what the the Italians call dolce far niente—roughly translated as "how sweet it is to do nothing." I also discovered how much I enjoy writing. A retirement tip: if you want to write in retirement, don’t wait too long. I have all these ideas for books that I will probably never bring to fruition because I’m just too old. I did manage to finish Feminism in Philadelphia: The Glory Years, 1968-1982. Although it has limited appeal—-mainly to women who participated in the second wave feminist movement in Philadelphia—-it is a contribution to the historical record and I’m proud to have written it. I‘ve had a lot of invitations to speak about the book-—books stores, libraries, schools, retirement homes, community arts centers—-and have found that there are more people who want to hear my talk about second wave feminism in the Philly than there are folks who want to read the book. I’m now working on a book about local grassroots politics and am gratified by the number of activists who have been willing to be interviewed. I sure hope this book doesn’t take me as long as it did to finish Feminism in Philadelphia: The Glory Years, 1968-1982. I have several other book ideas, if it turns out I have the eyesight and brain cells left. We’ll see. One of the most gratifying aspects of retirement is that I have had time for political activism. During my working years I was always falling asleep at meetings or missing meetings because I was just too tired. I no longer had the energy to work full-time and also have a second career as a political activist. I’m so happy that we finally have dynamic new leadership for an organization dear to my heart, Philadelphia NOW and also that the Philadelphia Democratic Progressive Caucus also has a committed, energized new leadership team. I was one of the founding members of the Caucus, but after some significant victories the founding members--in their 60’s and 70’s--were running out of steam. The new leadership is connected to a network of young Democratic Party activists and is well-positioned to make the Caucus a real force in Philadelphia political life. One goal I did not accomplish was learning conversational Spanish. Thanks to a slight hearing loss, learning a foreign language has become increasingly difficult. 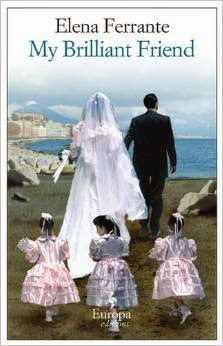 My goal now is to acquire a reading knowledge of Italian, so they I can read Elena Ferrante in the original Italian. That just may be achievable but conversational competence in Italian, Spanish or any language other than English is just not going to happen. The window of opportunity has passed. And although I spend a lot of time working in my garden and I enjoy it immensely, I’m not sure the garden looks any better than it did during my working years. I’ve accepted the fact that my garden will never be weed-free, that there are some things, I will never do, some places I will never see, and that’s okay. Although I still enjoy travel and we are planning another trip to Italy, I ‘m finding that I don’t want to travel as much as I had expected in retirement. I’ve become a real homebody and whenever we return from a trip, I always feel like I never want to leave Mt. Airy for a long, long time.